There’s no doubt that the human-animal bond produces remarkable and joyful partnerships or that man and animal can transcend the typical household pet relationship with an almost mystical connection. Chief among these profound associations is the growing practice of using service animals by those impacted by illness, accidents, or war: those who have chronic physical limitations or have endured deep or lasting emotional upheavals. Ranging from providing eyes and ears for people with visual and auditory handicaps to aiding wheelchair users by opening doors and retrieving objects and offering mental and emotional equilibrium to sufferers of post-traumatic stress syndrome, animals can help chronically ill, deeply anxious, and seriously injured owners fit into society. They bring purpose, affection, and independence to their lives. The connection between service dog and owner is a profound example of the human-animal bond. 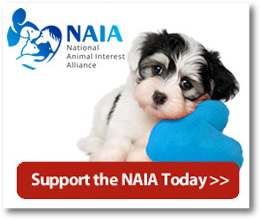 It is profoundly frustrating to us that some animal owners fraudulently present their pets as assistance or emotional support dogs for their own convenience, to save money or acquire other benefits they wouldn’t otherwise receive, or to enjoy the attention they receive when they arrive at an airline gate, restaurant lobby, bus stop, or apartment rental office. These selfish actions damage public acceptance of service animals and insult and disadvantage those who actually depend on animals for assistance. Therefore, as vigorously as we endorse and celebrate the use of legitimate service animals, we just as fervently oppose the actions of thoughtless and self-important owners who falsely demand the privileges associated with the Americans with Disabilities Act and other laws enacted to help persons with disabilities. The widespread use of service animals and the resultant freedom for their owners would not be possible without the direction provided by the Americans with Disabilities Act. The ADA defines service animals as “dogs that are individually trained to do work or perform tasks for people with disabilities” but it’s not exclusively dog-oriented: it also covers miniature horses trained to perform guide work. The law provides conditional public space access for people accompanied by their service animals, protects businesses and agencies from unruly animals, and guards the privacy of the animal owner by limiting the inquiries about medical conditions that require the use of a service animal. If the task performed by the animal is not obvious (i.e., aiding a person in a wheelchair or guiding a person of limited sight), those in charge in a public facility or business may ask if the animal is required because of a disability and what disability-related work or task the animal has been trained to perform, but they may not ask the nature of the disability or require proof that the animal has been trained or licensed to perform that service. State and federal fair housing laws also cover owners of service animals. The federal Fair Housing Act prohibits discrimination against handicapped owners but acknowledges the need to balance the health and well-being of the renter with the inconvenience to other tenants and the costs to the housing facility. For details, see this American Bar Association article. On commercial aircraft, the Air Carrier Access Act provides for the right of persons with disabilities to be accompanied by their assistance animals. The vast majority of service animals are dogs, some especially bred for characteristics such as intelligence, steadiness, and willingness to please, and others that exhibit these qualities but are not purposely bred, but come from a variety of sources such as shelters or rescue organizations. Other species have been used to perform tasks for people of limited ability too. 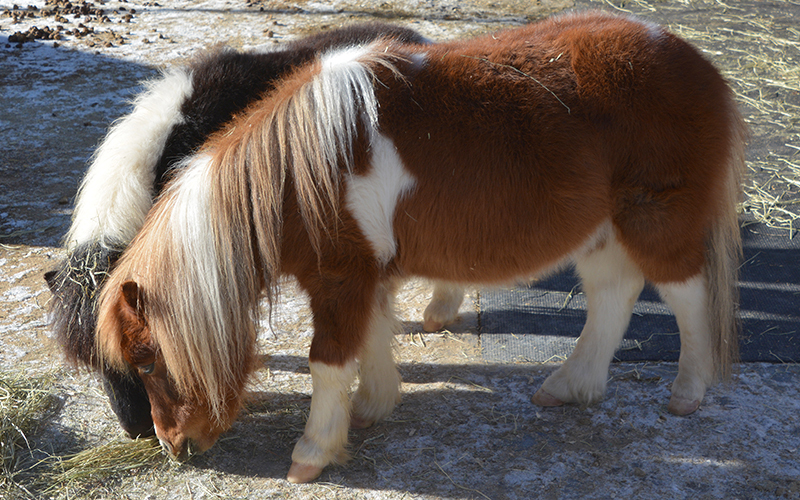 The ADA opened the door to miniature horses as guides for the blind in 2011. These calm gentle equines are longer-lived than dogs and have grown in popularity as guides since their ADA approval. The Guide Horse Foundation provides detailed information on the use of miniature horses as assistance guides. Miniature horses may not be your first thought upon hearing the word "service animal," but they can make excellent, long-lived guides. Helping Hands Foundation trains capuchin monkeys to provide in-home aid to people with spinal cord diseases and injuries that limit or prohibit limb movement. Capuchins have fine motor skills to pick up objects, scratch itches, push buttons, and perform many other duties that require manual dexterity. Like miniature horses, they are also long-lived. 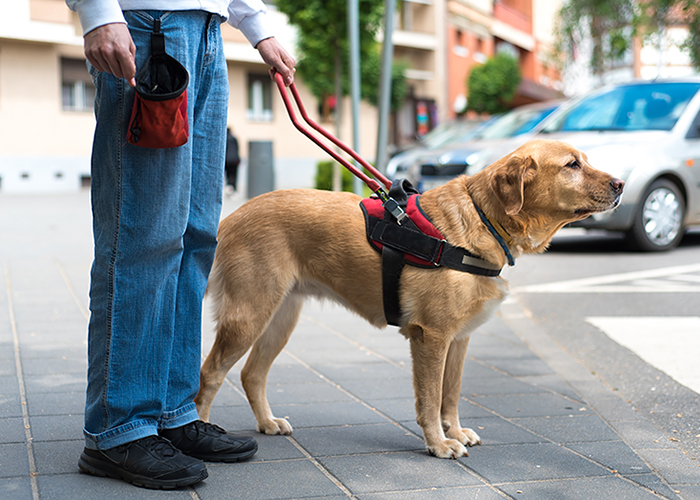 The ADA covers the presence of service dogs in public so that handlers enjoy the same access rights and courtesies available to people who do not have a disability. However, many service dogs aid their owners at home with a range of assistance from detecting changes in glucose levels for diabetics, alerting on doorbells and telephones for deaf owners; warning of impending seizures for sufferers of neurological disorders; retrieving dropped items for arthritic owners, and more. Remarkably, service dogs are assisting soldiers and others suffering from post-traumatic stress disorder to re-integrate into society and overcome fears of crowds, noises, and physical closeness. Some dogs trained to assist returning warriors with physical limitations caused by wounds also assist with the symptoms of PTSD. Research indicates that those with autism spectrum conditions can benefit from the companionship of a dog. However, the relationship goes deeper than companionship: Autism support dogs are often trained to gently interrupt the repetitive behaviors common to some types of autism and to keep their handlers calm in stressful situations. Today, dogs are also assisting with PTSD and autism. Emotional support animals aid owners with anxiety, depression, bipolar/mood disorders, panic attacks, and other emotional or psychological conditions. While emotional support animals are not service animals under the ADA, they are considered assistance animals by the Fair Housing Act and Air Carrier Access Act. Under these laws, the emotional support animal is defined as one acquired as part of a prescribed treatment program, and its use is substantiated by a letter from a medical professional. While medical and psychological research indicates that companion animals can lower blood pressure, decrease stress, and otherwise comfort owners and others who come in contact with them, NAIA does not believe that these advantages alone should constitute the basis for allowing a dog access to fly free in an airline passenger cabin, or access to all public spaces and transportation, or to receive a waiver from no-pet policies. Despite the uncontested benefits conferred to the individuals claiming these rights, we believe that such policies lack balance unless they also require appropriate training of the dogs involved, a mechanism for proving that the training requirement has been met and a penalty for fraudulently using these privileges. 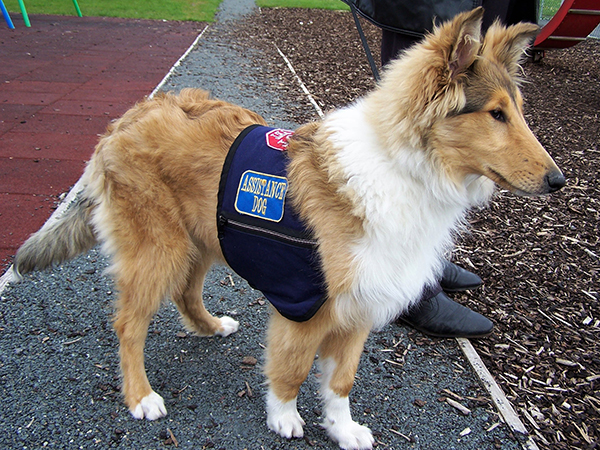 While not required under the ADA, many service dogs wear an identifying vest or harness while working. However, because the vests and harnesses are widely available through dog supply retailers and organizations, some dogs wearing them are deceitfully self-identified as assistance dogs by dishonest owners. Under the ADA, business employees can ask if a dog is trained for a specific purpose and may refuse or reject a dog that is ill-behaved. However, the rejection may be too late to avoid disturbing other patrons or causing a backlash against service dogs in public places or businesses. Service animals and emotional support animals are allowed to fly free with their owners in an airplane cabin. Most airlines require advance notice and a letter of prescription as evidence that the animal actually assists the owner in some capacity. Unfortunately, these letters are available from some online providers upon submission of a claim that the animal is necessary for the emotional well-being of the owner and a fee. These websites have come under increasing scrutiny because it appears that they are abetting the fraudulent misrepresentation of pets as assistance animals to make a profit. Several organizations provide registration for service and emotional support dogs, but the registration, and identification cards are not necessary under the ADA. 2016: Teddie, a five-year-old Labrador Retriever who is certified with Canine Partners for Life. His owner suddenly became paralyzed from the waist down at age 14. With Teddie’s help, this young woman has earned three college associate degrees, works a part time job, travels and volunteers as a spokesperson and demonstrator for Canine Partners for Life. 2015: George is a Great Dane from the Service Dog Project, an organization that trains dogs to help mobility impaired owners. George helps a 10-year-old girl, a victim of a rare genetic disorder that severely limits her ability to move around. Before she met George, she used a wheelchair or crutches to move around, but George gave her the strength and determination to walk and take part in activities she otherwise would not have been able to do. 2014: Gander, a shelter dog enrolled in a prison training program, has saved two lives; his training inmate has left prison and gone on to a productive life, and the Vietnam Veteran who later received the dog after additional training. Affected with post-traumatic stress disorder, depression, panic attacks and mobility struggles, the veteran has dramatically improved his ability to be in social surroundings and has gone on to raise awareness of the devastating effects of PTSD with Gander at his side. “Misuse of 'service animal' designation a growing concern,” ABC Eyewitness News, Los Angeles, CA, February 25, 2017.